The Tandy 100 was actually a computer made in Japan by Kyocera. All the ROM programs were written by Microsoft, and even a few of them were written by Bill Gates (!) himself ! These programs include a text editor, a telecommunication program, which uses the built-in modem (300 baud), and a rather good version of BASIC (no big surprise there). Kyocera made this computer for three main companies: Tandy, Olivetti (Olivetti M10) and NEC (PC 8201), these computers are the same except the case and some little differences in the programs and a few physical differences. The operating system uses 3130 bytes of the 8 KB RAM. So the 8 KB models (Catalog # 26-3801) didn�t sell very well. But there was also a 24 kb model (Catalog # 26-3802), and one year later, Tandy replaced the Tandy 100 with the Tandy 102 (which has 24 kb RAM too), and later with the Tandy 200 (1985). The CMOS CPU (80c85) allows to use the Tandy 100 for 20 hours with only 4 AA batteries (5 days at 4 hours/day or 20 days at 1 hour/day)!! 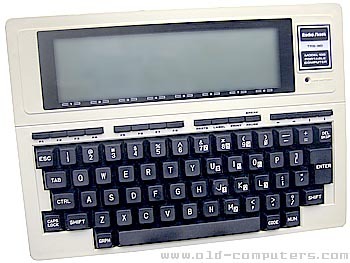 The model 100/102 is still considered and used as an excellent machine, mainly to type texts when you're on the move (you can transfer them to modern computers) and even to send and receive emails ! Fun fact : its CPU was also used on the Mars Pathfinder probe's Sojourner rover ! SIZE / WEIGHT 30 (w) x 21.5 (D) x 4.5 (H) cm. see more Tandy Radio Shack TRS-80 Model 100 / 102 Ebay auctions !